No bathroom humor, please. In Japan, toilets are serious business (no pun intended). Much of the ethos surrounding bathrooms, bathroom etiquette, and toilets in general stems from the strong Japanese ethos regarding cleanliness. According to some research, the earliest Westerners, mostly from Europe, in Japan in the eighteenth and nineteenth centuries could not get over how clean the cities were. Europeans tended to throw their bodily wastes into the streets, not only creating filth and odor, but also a breeding ground for disease. The Japanese, however, had toileting habits that involved waste disposal as early as the Nara Period in 710 AD. Even in that time they built holes make-shift outhouses over holes in the ground or over a stream. 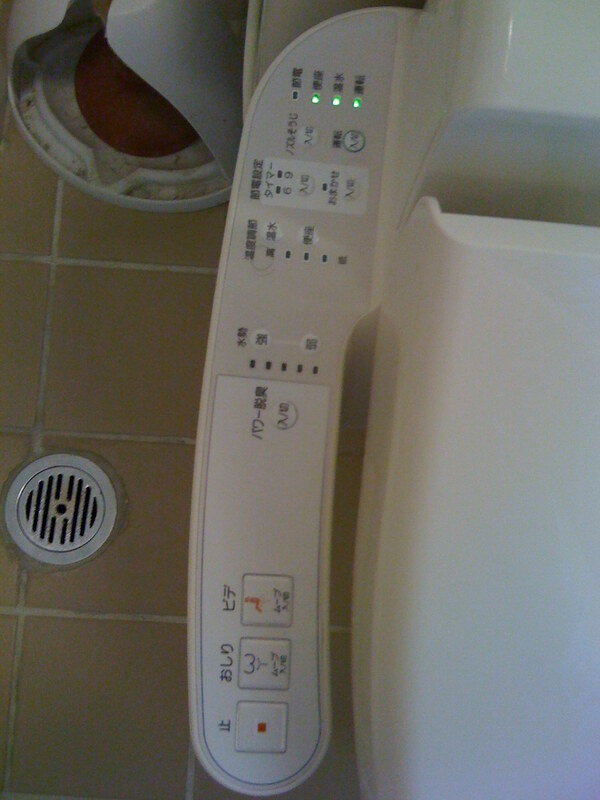 These days there are two types of toilets in Japan – Japanese and Western styles. it resembles a urinal laying down. Users straddle the toilet and squat down to do their business. Squatting in this way is a real art. Asians are accustomed to these positions and can easily keep their heels on the floor while squatting, keeping themselves neat if they are able to get their pants down completely below their knees. Westerners often have to strip down completely in the stall and hang their clothes on a hook, which many stalls have these days. In addition, the toilet often has a bar for someone to hold on to, or else their is a pipe for the plumbing, which can be grabbed. These provide obvious stability. Just because they are in the floor, make no mistake: these toilets flush – the waste is carried away into the sewers like any other toilet. They are very sanitary. They easier to clean and they use less water than other types of toilets. 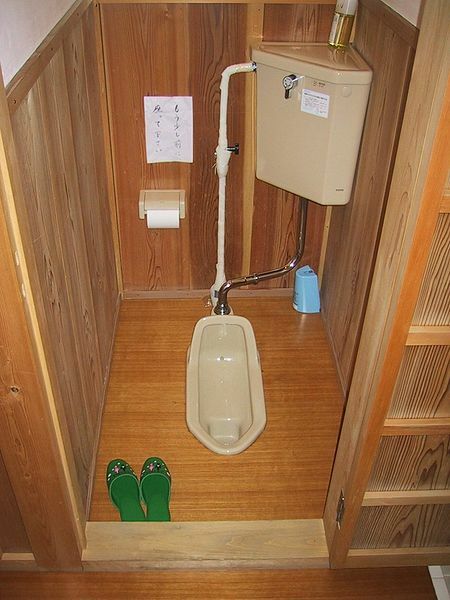 Some Japanese people believe that there are health benefits to these squat type of toilets. The waste exits the body more efficiently, which some believe to reduce the risk of colon cancer, and the position strengthens the hips and knees. For a woman, apparently there are benefits to the pelvic floor involved in squatting to release waste from the body. Of course, whether it is true or not, people also believe it is more hygienic to squat since there is no worry about germs spreading from toilet seats. The Washlet in my bathroom! In my house, however, we use Western style toilets. Of course, the Japanese being the Japanese, they have taken even Western toilets to new heights. These toilets have functionality. They wash, they cleanse, they dry and of course, they have an “automatic erase smell” button on them. Users control the temperature of the water and the pressure of it as it works its magic. We have a pretty basic model in the house, but in some places the toilet raises and lowers its own lid, has “small” flush and “big” flush options, and even plays music. The music or running water function is to create privacy. A number of years ago, the TOTO toilet company found that women in particular were flushing the toilet to create a sound while they did their business in a public restroom, lest anyone know precisely what they were doing in that stall. The amount of water wasted by these extra two to three flushes was astronomical. So many public restrooms contain either a button on the toilet to create a flushing or running water sound, or even have a small, separate machine on the wall of a stall to make the sounds covering the bodily functions. 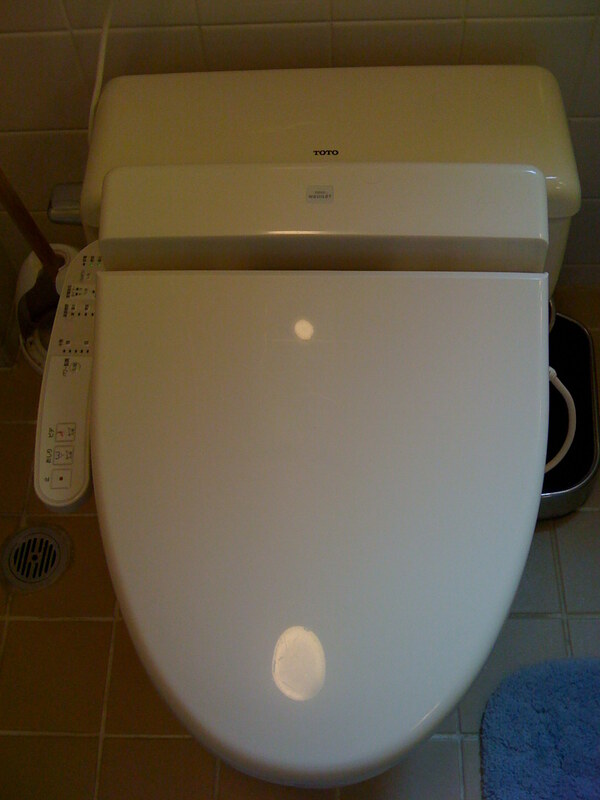 Of course then there’s my absolute all-time favorite part of the toilet: the heated seat. My husband and I have continual debates over the temperature of our toilet seat. He sits so seldom though, that I win. The toilet seat is extra toasty at all times for me. The reason I’ve been thinking about this all week is because of our ski trip: outside of Tokyo it is harder and harder to find Western toilets! People in the countryside of Tokyo much prefer the squat type! Like many things in Japan, toileting is one of the aspects of the culture that people take seriously, much more seriously than most Westerners. Even in the bathrooms of the country, there’s never a dull moment. Heated toilet seats are catching on over hear. A friend of ours, over New Years, was eagerly asking about our bathroom experience and how the seat was… because she just got a seat warmer and adores it. The thought never occurred to me… Then I went to my Mom’s house and realized that her toilet is RIGHT NEXT to the old-fashioned radiator, so it was ALWAYS toasty warm in the winter.